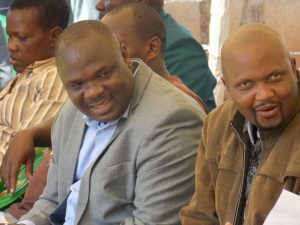 Kuria West MP Mathias Robi (L) and his Gatundu South counterpart Moses Kuria at Nyabikaye SDA. Kuria West MP Mathias Robi said he was ready to bury Migori senator Wilfred Machage’s political career in August 8 polls (READ THE EARLIER STORY HERE). “He is welcome in Kuria West race but am afraid his re-election is near zero. He has nothing to show for his time as senator in all the eight constituencies of Migori county, most importantly in Kuria region,” Robi told Migori News. The legislator said Machage only legacy as a Kuria legislator in the past decade before joining senate was high bred clannish in in the region. “It is this brand of clannish politics that demoted his star in the county as he destroyed the relationship between Luo and Kuria communities, making his re-election to have zero chances,” he said. Robi said that Jubilee remains the only main party in Kuria region and any other party Machage will pick will be inconsequential. “Jubilee has built two colleges in Kuria, expanded Migori-Kehancha tarmac road and got us jobs in government while I was the legislator, any party Machage picks will be redundant,” he said. On July last year Machage threatened to pull the Kuria community out of ODM citing disrespect in the party and was accused of not ensuring the community voted as a bloc for Raila in the last polls. “If you (Machage) used the same road to come to us, please us the same road to go away and leave us in peace,” Raila told him afterwards. i really thank our curreny mp, hon robi……whatever he has done can be seen on the ground , we are very proud of him as our mp we the university students. specifically i being the Secretary of mabera university students association am very happy for his leadership tenure, he has done a lot indeed in our subcounty. we hope to vote him august 8.